I'm so exited that i finished my first summer dress! I really needed one and the ones i started, for some reason, i never finished them (didnt like them, weren't what i wanted, blah) lol, but this one i did like, i actually love it so much. When i saw the fabric, i wasnt so sure but i went ahead and bought it because it was the only one i liked that was light and streachy and cheap, it was $1.30 USD/ metter. I started it this morning and worked on it on and off all day. It's a bit hard to sew when there's a little boy pulling on your leg hehehehe. i'm still not sure if it fits my figure or makes me look weird. sorry the pictures are so crappy, there's no one to take them and these two are the best of the bunch. 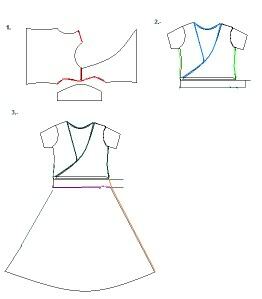 To dut the skirt part just fold your fabric in half and measure half of your waist in a corner, and the length as you would a regular circle skirt. The waist band is about 2.5 in. 1. 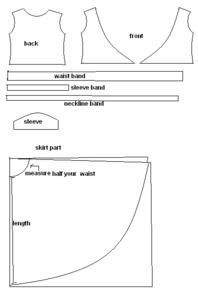 Once you have your pieces cut, sew the top parts, back and both fronts (marked in red), first neck to shoulder and then attatch the sleeves but dont close them, yet. 2. Sew together the back with the wrap parts (marked in green). Attatch the neckline band: fold it in half and while you sew it streach it a little. 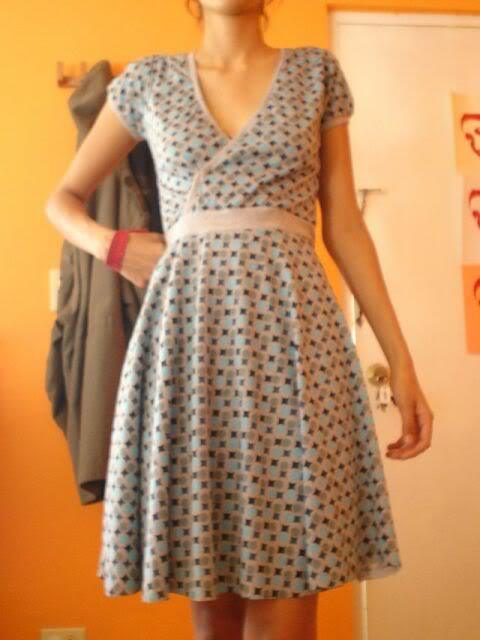 Nos sew the waist ban to the top part of the dress. I found it easier to sew the wrap parts (or pin them) how i wanted them before sewing the waist band. Hem the skirt if the fabric needs it, and sew the sleeve bands to the sleeves gathering the sleeves a little (or a lot) to create puffiness (also streach the bands while sewing). Re: Circles and dots blue & blue! 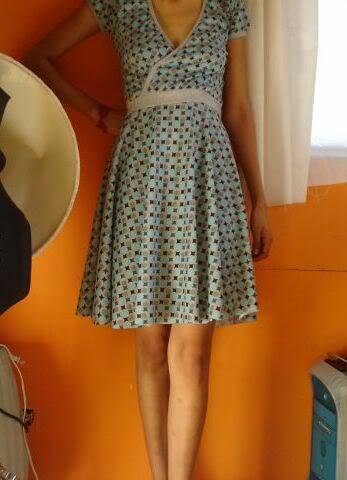 !First summer dress !! I don't seem to be the same today as I was yesterday. that is an awesome dress. 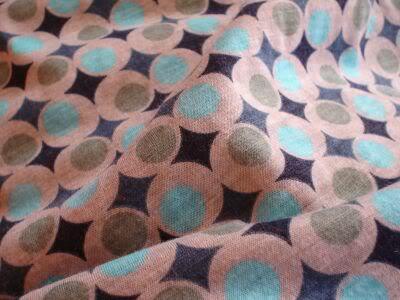 I really like the fabric, you gotta love retro c'mon! I think it looks great and comfortable too. It's fabulous great!! Where'd you find such great fabric? Could you post a tutorial? I didnt use a pattern, i was inspired by a dress a friend has, so i pictured in my head how i would go about making it and i just cut it, the top parts i traced a shirt that fitted me well and the skirt part ... well.... i had to think about it really really hard because i didnt want to waste any fabric but it's a half circle skirt, i think that's what it's called. I got the fabric from a local store that sells scraps and fabric they get from [probably] fabrics in LA or something like that. It's like a family business, but i BET you can get something as cute and maybe even more in joann's or a big store like that. There's one need (san diego) that i've never been but very curious of what they have but i'm way too lazy to sit in my car to cross the border. Sure i can make a tutorial. It'll make it simple and posted, hopefully, tomorrow. Thanks again! I'm very happy you all liked it. it's great! i like how it drapes in the front...and the fabric! only $1.30 is an awesome deal. looking forward to the tute. thanks for being generous. gorgeous! it looks so flattering too! the fabric looks great also. ^I love him in a thousand ways.